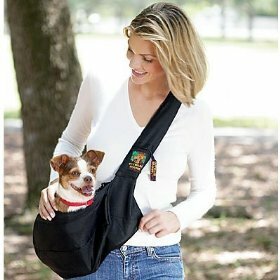 Last Thursday I reviewed Outward Hound’s “Sling-Go Pet Carrier,” and today I have the pleasure of offering it to a Dog Jaunt reader! Many thanks to The Kyjen Company for sponsoring this giveaway. Using the form below, please tell me about a favorite dog-friendly place — a park, hotel, shop, or restaurant that you and your dog have enjoyed together. Choose wisely, because you only get one comment per giveaway! If you subscribe to Dog Jaunt or follow @dogjaunt on Twitter, however, you will get additional chances to win. Subscribers, please insert the secret code at the bottom of each post and type it into the form. Twitter followers, please type in your Twitter name. Please submit your comments before 11:59 pm (Eastern time) on Tuesday, Jan. 5. We will choose a winner randomly, and the results will be announced in a post here on Dog Jaunt on Wednesday, Jan. 6.